Reused is better than Recycled which is better than Trashed. The team has been collecting items at Viv headquarters (HQ) for a donation run and to get some “reuse” from things collecting dust: old clothes, printers, cables, and a ton more. The team hurried through lunch and bounced over to the local Salvation Army for a drop. A big bonus: the California sun was out with blue skies! What a day to stretch the legs. 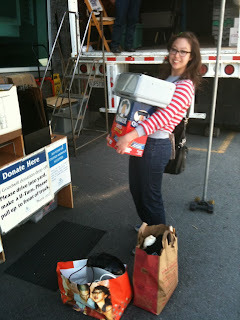 With arms full of boxes and bags, we even reused some “old-fashioned” food packaging to bundle up the loose clothes. Jenny with her hands on a giant Quaker Oats box... oats, yum-yum! Having an (eco) excuse to get out of the office never hurts. I admit… I had to make a “green” reference somewhere. Anyways, did you ever think you’d see such a big smile on someone carrying a giant box of oatmeal?